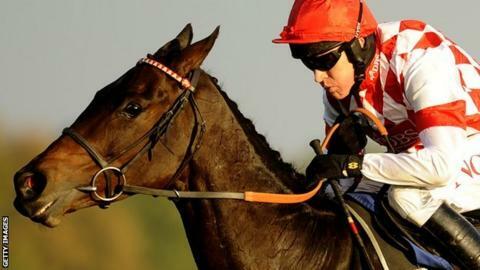 Riverside Theatre gained a narrow win in the Peterborough Chase at Huntingdon from Champion Court and Captain Chris. The 9-4 favourite, ridden by Barry Geraghty for trainer Nicky Henderson, prevailed by half a length. It was a first victory for Riverside Theatre, who is co-owned by actor Jimmy Nesbitt, since winning at the 2012 Cheltenham Festival. Captain Chris, a neck behind the runner-up in third, was conceding 10lb in weight to the winner. Riverside Theatre, second to Long Run in the King George VI Chase run in January 2011, completed a Grade One hat-trick when winning the Ryanair Chase at Cheltenham in March 2012, but finished out of the frame in his next four runs. Champion Court, trained by Martin Keighley, was also in better form in the Grade Two Huntingdon race, having finished a disappointing seventh when favourite for last month's Paddy Power Gold Cup at Cheltenham. Captain Chris was only just beaten by Long Run in last year's King George, and this encouraging performance may tempt Philip Hobbs to run him again at Kempton on Boxing Day in a fortnight.